Last summer, four of the markets under the 25-year-old Portland Farmers Market’s umbrella made a big change to the way they handle their waste. As part of the Market’s ongoing initiative to reduce the amount of waste generated by the markets, they replaced hot food vendors’ compostable dishware with durable, reusable dishes and silverware. Compostable dishes were introduced in the market back in 2010 with great results. The organization’s largest market typically produced 60 45-gallon trash bags per market day loaded with food scraps, plastic water bottles, disposable coffee cups, paper plates, packaging and other discarded items destined for the landfill. The switch to compostables diverted more than half of that waste into compost or recycling. 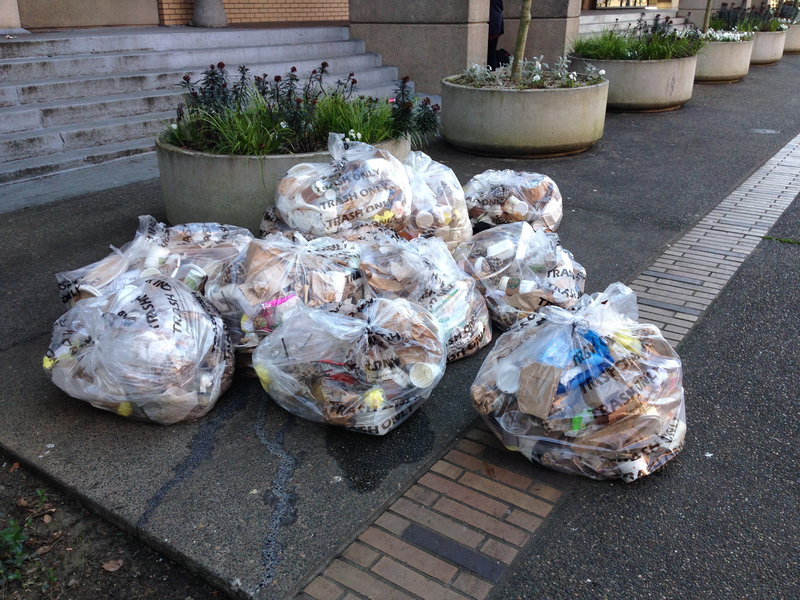 While this was a huge step in the right direction, operators were still seeing compostables in the landfill bins. Then, in 2015, the City of Portland changed its commercial composting rules to disallow non-food waste. 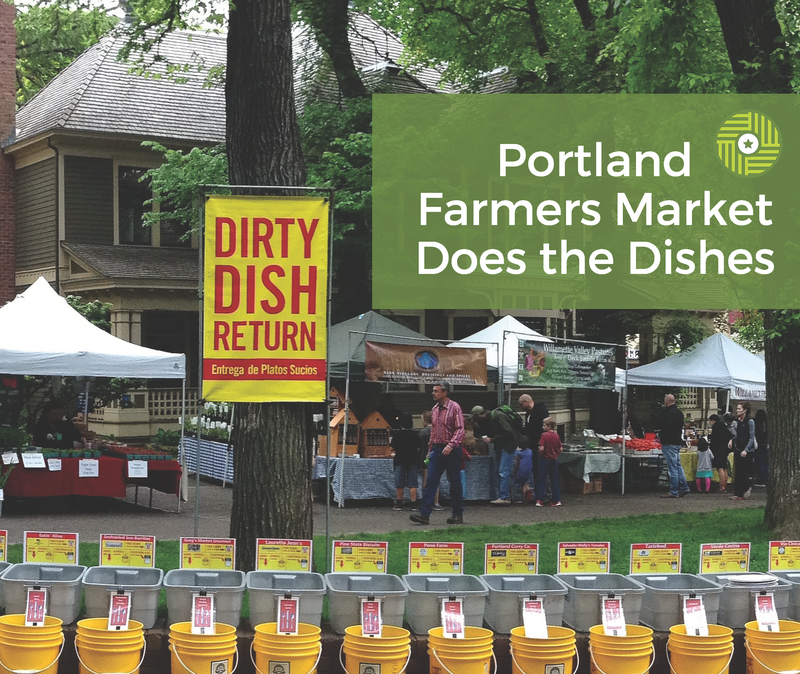 Rather than lamenting the change, the Portland Farmers Market team seized the opportunity to make the switch from disposables to durables. Now, prepared foods vendors at the Portland State University, King, Northwest, and Kenton markets have replaced compostable dishware with durable, reusable dishes and silverware. As a result of this switch, landfill output at the flagship PSU market has been reduced by more than half, from an average of 25 bags of garbage per market to nine. Plus the compost stream is clean and entirely free of nonorganic matter, which is what the City of Portland’s new rules require. 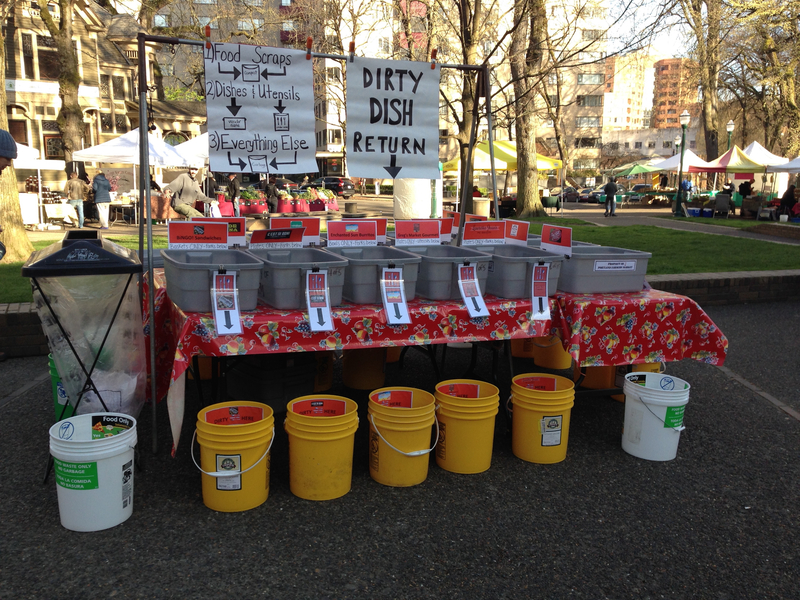 Taking another step towards zero waste was an easy sell among Portland Farmers Market’s vendors and shoppers, and feedback has been positive all around. Market vendors have increasingly been making their own stalls more sustainable for years, reducing sampling supply waste and repurposing used produce containers. Any extra effort is worth the outcome. From a market shopper’s perspective, the change adds a touch of formality to the market-dining experience, with no added hassle. After enjoying a meal with “real” plates and flatware at Portland State University, King, Northwest, and Kenton markets, customers return used dishware to specially marked bins at the dirty dish stations where they can also find compost, recycling and waste receptacles, as well as drinking and hand-washing water. Dishes are sorted throughout the day by market staff and returned to vendors each week for washing, sanitizing and service at the next market. For more information about Durable Dining, email contact@portlandfarmersmarket.org.